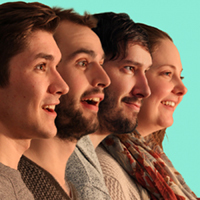 This four mem­ber sketch com­e­dy troupe presents sev­en sketch­es and an intro in a quick 45 min­utes. I saw this show on a day that had a fair­ly well packed crowd that was row­dy and ready for com­e­dy. The show itself was fun and fast paced, the sketch­es were okay but not super hilar­i­ous or well writ­ten. How­ev­er, the audience’s enthu­si­asm made up for some of the show’s short­com­ings and made the over­all expe­ri­ence quite enjoy­able. This is not a bad show, but not a great one either.